Galaxy S7 Edge CM14.1 (CyanogenMod 14.1, hero2qltechn) Nougat ROM is an unofficial CM14.1 build. Here we also have the Lineage OS 14.1 for Galaxy S7 Edge. For latest updates, stay tuned to the Lineage OS device list page. In addition to this official ROM we have update many OFFICIAL CM14.1 (CyanogenMod 14.1) for many supported devices and many Unofficial CyanogenMod 14/14.1 ROM updates. This CM14.1 is ONLY for Galaxy S7 EDGE SNAPDRAGON variant and this build is brought to you by developer travis82. Earlier travis82 had brought the CM13 for S7 Edge SnapDragon variant. If you like this ROM or work of the developer then please consider a donation to Travis Mills (travis82). 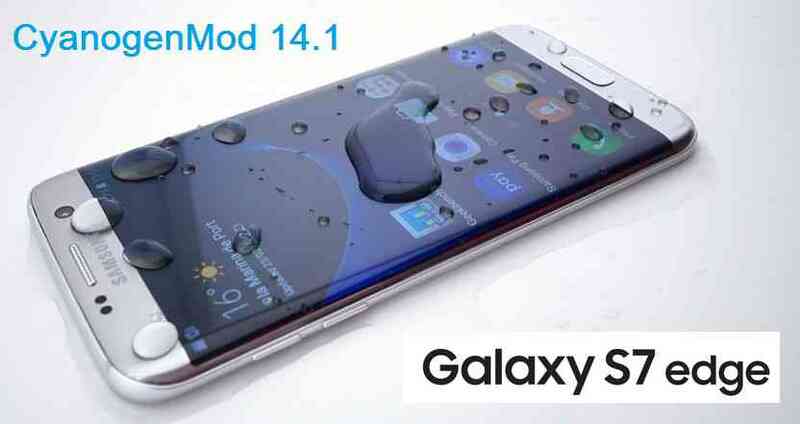 Download and Copy the GApps and Galaxy S7 Edge CyanogenMod 14.1 ROM ZIP to your phone. Reboot and Enjoy the CyanogenMod 14.1 Nougat ROM on your Galaxy S7 Edge. Copy the latest Galaxy S7 Edge CyanogenMod 14.1 ROM ZIP file to your phone. I notice the latest build is dated 2017-02-15. Would this build just be a rubber stamp of the original build from one month ago? Is there a changelog for the later build? I can only see the following: lineage-14.1-20170205-UNOFFICIAL-hero2qltechn.zip, which has the build date as: 20170205 (5th Feb 2017). There is no changelog from travis82 (the developer of this ROM) for this build. The link to the rom lists 3 roms dated in February. Would these just be re-builds of the original rom released on December 11th? Or would this include various bug fixes etc? Before I invest time on this I need to get some idea of what is currently in the build. If anyone has installed the build from the 7th and it’s working, what is working? So Im confused by this. This is posted under the forum Galaxy S7 Edge – G935F which does have an unlocked bootloader. However the G935F does NOT have a Snapdragon processor. The models that have Snapdragon all have locked bootloaders. So please clear up a few questions for me? Is this a snapdragon rom? How do you unlock the bootloader? Or is this for G935F (Exynos)? This Lineage OS 14.1 is for Galaxy S7 Edge SNAPDRAGON variant, SM-G9350 if I am not wrong. Updated the forum name accordingly. No need to unlock the bootloader. Just download the ODIN flashable TWRP zip file and flash it via ODIN application, that’s it.